Synopsis: As Americans spend more time nesting in their homes, they strive to feather their nests with comfort and style without spending a lot of time or money in the process. The solution is to make it yourself. Popular TV personality and home dec expert Sally Cowan provides dozens of decorating ideas and easy-to-follow instructions for projects that add high fashion details to any home. From window treatments to pillows, bedrooms to bathrooms, home offices to motorhomes, there are home decorating projects to enliven any decor. Sally recommends fabrics, colors, and techniques to achieve stunning results and illustrates how dramatically easy and inexpensive accessories can change the look of a room. Sally includes comprehensive information on fabrics, measuring, sewing, serging, and hand stitching, as well as step-by-step project instructions with photos and illustrations to help any home dec sewer achieve success, regardless of skill level. -Window treatments. -Table and bed covers. -Pillows. -Tips for hard-to-decorate areas (home office, bathroom, motorhome). 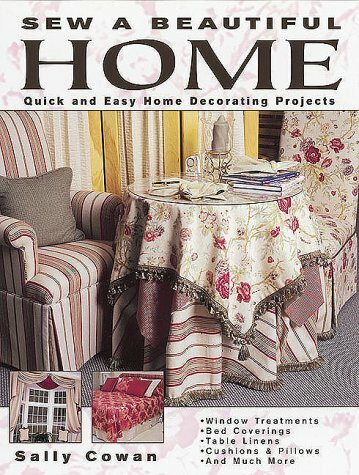 From Library Journal&colon; Each of these books provides sewing projects for sprucing up the home. The two Krause publications are very similar and cover a wide range of projects, including window dressings, bed and table linens, cushions, and pillows. Cowan's book begins with detailed information about equipment, fabrics, sewing techniques (including serger instructions and left-handed and right-handed stitching), and projects for pet cushions and computer covers. However, Sew-It-Yourself Home Decor has the more clearly illustrated instructions to the projects, with simple and elaborate styles shown. Window Dressing gives clearly written and well-illustrated instructions for making simple styles of valances, curtains, and drapes. Sew-It-Yourself Home Decor is a good candidate for public libraries. Purchase the other two titles if there is a strong interest in sewing for the home.